The organisation honoured 30 WA members at its annual Investiture of the WA Commandery of the Order of St John. Maria Kay Godwell was promoted to commander in recognition of 35 years service, which began when she started as a volunteer in 1978. Ian Smith was recognised as an admissions member for his nine years, while Craig Pearce and Karen Reynolds both received commendations. 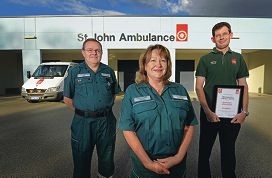 St John chief executive Tony Ahern thanked members for their contribution. ‘Being admitted to, or promoted within, the Order of St John is a great honour and we are very proud of those recognised this year,’ he said.